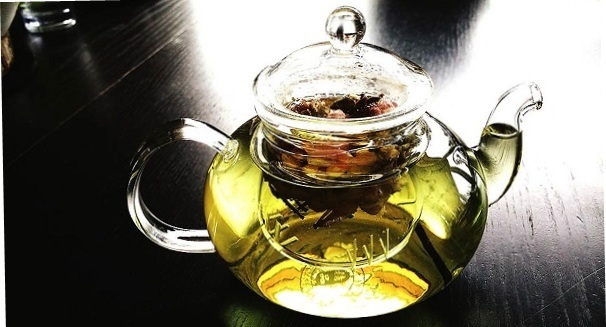 How can you use tea to care for your hair: strengthening them, getting rid of dandruff? To strengthen the hair every evening rub the head skin with strong tea. This is good for hair growth. It is recommended to conduct 7-8 procedures. Hair treatment. Against dandruff, a tablespoon of castor oil, mix with a tablespoon of tea broth (a teaspoon of tea, pour 1/4 cup of water, boil for 2-3 minutes, in a warm form strain through the tissue) and a tablespoon of water. With this mixture, moisten the head and leave for 2-3 hours, then wash the head warm water. The procedure should be repeated 2-3 times a week until the disappearance of dandruff. Tea broth can also be used as a curl fixer when winding on curlers. 2 teaspoons of tea pour a glass of boiling water, let it brew for 5-7 minutes, strain and add 0.5 teaspoons of sugar. When winding with a cotton swab moisten this solution with each strand, then dry the hair — and you are not afraid of any wind. Hair treatment. Do I use tea to color my hair? use only freshly prepared tea for coloring, and insist tea need not be long. This is due to the fact that the excess of tannins, appearing in the solution with prolonged infusion of tea, prevents the shine of the hair. There are such folk recipes for hair styling tea. If you want to give your hair a beautiful chestnut shade, then 2 tbsp. Spoons of black granulated tea pour 2 cups of boiling water and simmer over low heat under the lid for 20 minutes, then strain. Warm infusion of tea on freshly washed and dried hair, cover hair with a plastic bag, and then with a towel. Hold this for 15-20 minutes to give a chestnut shade or 30-40 minutes if you want a darker color. To wash off hair it is not necessary. A copper shade can be obtained with the help of tea and walnut leaves. 2 tbsp. spoons of black tea and 2 tbsp. spoon the crushed dried leaves of the walnut, pour 0.5 liters of boiling water and simmer for 20 minutes, then let it brew for 10 minutes, strain and apply the solution to the washed hair. Hair treatment. How to tint the gray hair with tea? If you want to dye your gray hair in brown or chestnut color, then a teaspoon of tea leaves, pour a quarter cup of boiling water, insist 15 minutes, strain and mix this infusion with a teaspoon of cocoa powder or instant coffee, stir well and apply on hair. This paint masks the gray hair for a few days. And further. It is widely known that the best natural dye for hair is henna. If you use tea decoction to dilute henna, you can enrich the palette with warm brown tones. Hair treatment. Is tea used to care for hands and nails? For this purpose, mainly green tea is used. To soften the skin of the hands it is useful to make masks from green tea and potatoes or from green tea and oat flakes. For example, boil 2 medium-sized potatoes and mash them with tea infusion to a gruel-like condition. With brittle nails, mix 2 tbsp. Spoons of vegetable oil and 0.5 cups of freshly brewed green tea. In this solution, every day before going to bed, lower the fingertips to 5-10 minutes. The solution can be stored in the refrigerator for 2-3 days, but before use, heat it to 38-40 ° C.
A good nourishment for nails will be a bath of green tea with lemon juice.